Last night the Four of Us voted on a this week's challenge, the vote was unanimous. It's time for the Bedside Book List Challenge. What books are beside your bed? After our weekly Books for Walls Meeting (which also covered the launch of our first contest this Friday, watch for it!) The Mom photographed the books beside each of our beds. Please note: we were only allowed to adjust the books to show their titles --we didn't add any or take any away! We'll feature each of our pictures and list of books over the next week, The Little Sister The Dad, The Mom, and The Big Sister. Click here to check out all of the photos! beside your favorite reading spot. So typically, I have anywhere from three to five books at my nightstand and usually, a favorite book of poetry for those nights when I need a little inspiration, but am too tired to read for any length of time... But right now, I'm in over my head! Earlier this month I moved, and in so doing, culled my bookshelf for books I could 'get rid of' OR 'read!' (because I hadn't yet read them, or had not finished reading them). As a result, I vowed a summer reading goal of getting through all of the books on my shelf. So far, I'm about one-third of the way through the first one, A Fine Balance by Rohinton Mistry. As I foraged through this piled high pile, for titles, where some face in and some face out (do you know me??? ), things began to...ahem... shift. So, this was the end of such a pile... for now... When it tipped over I decided it was a good time to decrease it's size! 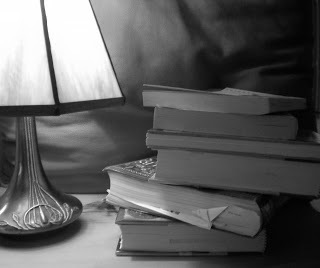 When I go to bed at night I plan to read, at least a little bit, every night --therefore I keep all the books I am currently reading there to wait their turn... I have to finish Island Beneath the Sea TODAY --it's due back at the library! A Strong West Wind by Gail Caldwell. Once I get through these, I have a long list of memoirs (my favorite genre) to start in on. Off to our new neighborhood book club. My list is so short because I am in the top of a bunk bed and it is hard to have ten or 11 books jabbing me in the ribs when I sleep --which is exactly what happens when I have too many bedside books! Only one...Goat Song (Brad Kessler). A constant rotation of children's books shuffle through our bed space, but from fear of damaging library books, all books are promptly taken care of! It seems like such a sin to work at a library and damage books at home.